Norman Lee Good was born April 22, 1952 in Kansas City, Kansas and departed this life, unexpectedly, on January 20, 2019 at his home in Pleasant Hill, Missouri. He was the son of Lee Gordon and Lilly Juanita (Horn) Good-Love. Norman spent his younger years in Kansas City, Kansas, graduating from Washington High School in 1970. Norman worked for Vanguard Packing Company in the sales division until declining health forced his retirement. For several years, Norman lived on his farm in Chillicothe, Missouri. He loved every aspect of the farm life, especially his cattle. When his health prevented him from working his farm, he sold it and bought a house in Clinton, Missouri. He always said the Clinton house gave him the “best of both worlds”, out his back door was a golf course and out the front door was Truman Lake. Norman lived in Clinton until August of 2018, when he moved to Pleasant Hill to live with his daughter Angie and her family. 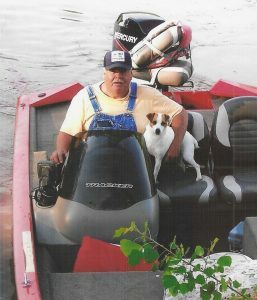 When his health permitted, Norman loved to play golf, hunt, and was an avid fisherman. He also enjoyed singing and playing country music, especially Merle Haggard songs, with his friends. Norman was a member of the Church of the Nazarene of Clinton, Missouri. He was a former member of the American Legion of Bolivar, Missouri and the Elks Club of Clinton, Missouri. Norman was preceded in death by his parents, Lee and Lilly Good, and one daughter, Brandi L. Good on December 19, 1995. He is survived by one son, Terry Essary and wife Joy of Erlanger, Kentucky; two daughters, Penny I. Essary and husband Bif Bunch, and Angie Good and husband Robert Fields all of Pleasant Hill, Missouri; two brothers, David A Good and wife Donna L. of Chillicothe, Missouri, and Chris E. Good and wife Becky of Malta Bend, Missouri; one sister, Susie R. Clayton and husband Robert of Douglasville, Georgia; grandchildren, Tiffany L. Essary of Charleston, South Carolina, Emily M. Essary of Japan, Parker L. Lawson, Alex J. Good, James Fields, Joyce Ketchum and husband Joel all of Pleasant Hill, Missouri and Joe Gomez and wife Bailey of Charleston, South Carolina; great-grandchildren, Alaya L. and Ethan Myers, other relatives and many, many friends. Funeral Services for Norman Lee Good will be held at 10:00 a.m. Monday, January 28, 2019 at the Wallace Funeral Home in Pleasant Hill, Missouri. Pastor Tom Waller and Pastor Ryan Holt will officiate. Casket Bearers will be Parker Lawson, Chris Good, Jr., Adam “Stick” Cummings, Gary “Rook” Smith, Brian Nickel, Ismael Montanez, Brandon Peck and Andy Myers. Interment will be in the Pleasant Hill Cemetery. The family of Norman Lee Good will receive friends Sunday, January 27, 2019 from 2:00 – 5:00 p.m. at the funeral home. You will always be in our hearts Cousin . Our prayers are with our family . Tell we meet again . We just want you to know that we are really sorry to hear about your father, he was a wonderful man. We have so many good memories of him here at the lake. May he rest in peace.